In the wake of U.S. intelligence reports that Russia meddled with the 2016 U.S. election using fake social media subscriptions as one of its tools, Twitter started to lock suspicious accounts and did not count them toward the calculation of its daily and monthly active users. An account is considered suspect if it generates a large amount of activity after months of being quiet. This past week it stopped counting these accounts toward the total number of Twitter members' followers. Pop star and American Idol judge Katy Perry saw the number of her followers on Twitter shrink by a massive 2.8 million users on Thursday. Because Perry has the most followers of any Twitter user with more than 107 million prior to the purge, the 2.8 million followers that disappeared from her account represented just 2.6% of the total. The purging of locked accounts negatively affected President Donald Trump, who lost 300,000 of his followers. The current data shows that there are still 53.1 million Twitter accounts following the president. Among prominent and verified accounts that were barely affected, tech executive Elon Musk made out the best. 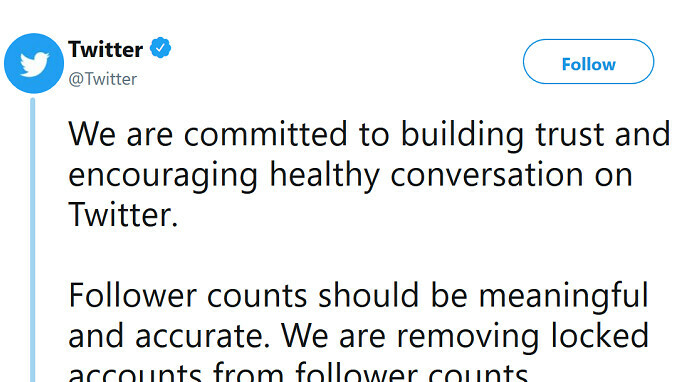 Musk had only .3%, or 71,000 of his followers erased by Twitter. That leaves him with 22.2 million Twitter accounts following his tweets. "Most people will see a change of four followers or fewer; others with larger follower counts will experience a more significant drop. We understand this may be hard for some, but we believe accuracy and transparency make Twitter a more trusted service for public conversation. Though the most significant changes are happening in the next few days, follower counts may continue to change more regularly as part of our ongoing work to proactively identify and challenge problematic accounts. On a percentage basis, the most affected account among the top 100 by followers was the company's own @Twitter account. The latter saw 12.4% of its followers disappear overnight. The account still has 55 million followers. Twitter says that the median decline in followers among the top 100 was 734,000 accounts. The average number of followers lost by all Twitter subscribers was four. And we care, because? Seriously, the topics and content on this website have declined greatly in the 10 years that I've been here. because this article relates to social media, which is covered a here every now and then. use the brains mr. jesus christ gave you. what was the content here 10 years ago, though? same news/reviews about tech and social medias ? oh sh*t, just because katy perry is mentioned here (which yall despise because pop culture is so shallow hurr durr and we're intellectuals) y'all have to jump on this phonearena bandwagon of hate. if you don't care, why did you click? why did you read it? why did you comment? if news about covering social medias aren't your cup of tea, don't sip it. You are whats wrong wrong with modern society and this website. You're the very embodiment of a liberal. Your motto: You can say or do anything you want as long as I agree with you. If not, I will attack you and whine or sue you until you have to agree with me. Pathetic. This is PHONE Arena. Should be about phone tech and phone related topics. In all reality, there shouldn't even be mention of tablets. I wonder how many people Donald Trump will end with. I have list 2.9 mil. followers. Not a big deal, still alive. Probably one meaningful factor in this whole article is mention of Elon Musk. I thought it was because she re-released "Eye Of The Tiger" or something. Wow... is it going to be the end of the world?